On with the 2nd Division – starting with the 18th Battalion of the 4th Brigade. All of the figures in the 4th Brigade are from 1st Corps. The 1st Corps figures a bit on the chunky side, but I actually don’t mind. 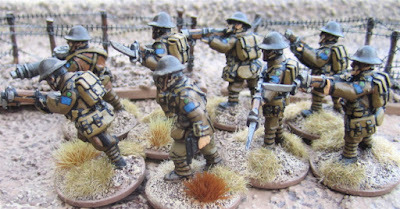 I think some of the sculpts are really fun and full of character – and in some poses I haven’t often seen in wargaming miniatures – cocking rifles, reloading and reaching into webbing for ammo, etc. I realized, while painting these that a few of the figures I initially thought were infantrymen (because they were carrying rifles) are actually officers?! One was from a pack of Officers and NCOs – I figured the two with pistols were officers and the two with rifles were NCOs. Wrong-oh! On closer observation (once I actually started PAINTING the guys) one of the guys I thought was an NCO is actually another officer carrying a rifle. The THIRD officer in this unit actually came in the “Advancing/Charging” pack. I suppose I could have done some converting… but I was in painting mode and couldn’t be bothered at that point. I’ll have to look at the other battalions and maybe carve off the officer-ish details on the same figures in the other battalions. The formation patch for the 18th Battalion was a green square surmounting a red patch – the blue patch was for the 2nd Division, the circle indicated the senior battalion within the brigade and the green was the senior brigade within the division. I hope to get a couple more cracked out over the long weekend –in between playing a few games - so stay tuned. Great looking minis as always Tim! Yes, a nice variety of poses, one of the developments of the great war was officers carrying rifles in an effort not to be identified by snipers, the ruse seems to work with wargamers too! Great looking chunky ww1 types, the blue block looks big enough to notice but not too big. Thanks Iain. The differences are minor - lower tunic pockets, cuff details, tunic open at the top showing shirt and tie, and of course webbing... as you say, with the rifle, few will likely notice on the tabletop. I was going to say the same thing (Ia(i)n's are thinking alike. I wouldn't mess around with converting those officers in the future and taking time away from painting. Just do up as being terribly fashionable and being in with the latest trends. You probably do need to put some sort of marker on the base though to help those in the fashion outs identify the officers. Alas I have already started carving off details and then last night just noticed that I am out of green stuff! Guess I'll have to pop over to my FLGS and pick some up. I'm trying not to go TOO overboard with the conversions! Cool post. I found this doing some research about the 18th. I blog about this battalion. Thanks Eric! I will definitely have to check out your blog!